On 17th July 2014, hundreds to thousands of people outside the local Indonesian Parliament office in Timika, West Papua, peacefully protested for an independence referendum and for the release of the scores West Papuan political prisoners who continue to be held behind bars by the Indonesian government. There was a very heavy presence of armed Indonesian soldiers, police and intelligence who did not tolerate the protest for very long and even the night before the demonstration, a local Papuan, Ruben Kayan was arrested, intimidated and tortured by Indonesian police for distributing leaflets calling for the protest. After he was released, the Indonesian authorities began to brutally crack down on all the other demonstrators. They arrested a total of 25 Papuans: 16 men, 5 women and 4 young children, all of whom were detained at the local Mimika police station at 32 Mile. At least 13 of those arrested, including a 16 year old boy were severely beaten and tortured by the Indonesian authorities. 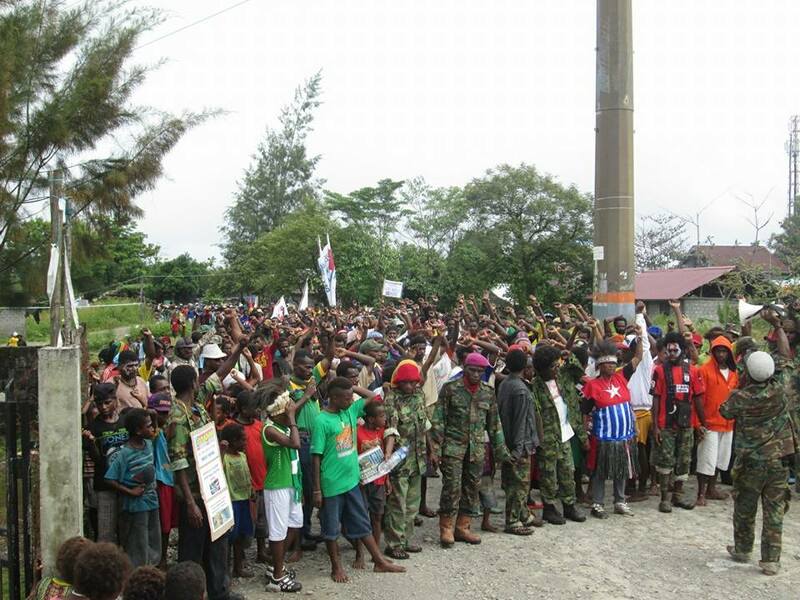 The West Papuan civil organisation, the Mimika People’s Regional Parliament (PRD), took action by helping putting pressure on the Indonesian police Chief in Timika/Mimika to release the innocent people, including children held behind bars. We asked that people please demand that he immediately release all peaceful people arrested in Timika on 17th, especially any children, that all the torture and human rights violations by police be stopped and that a full investigation must be held into the beatings and torture of peaceful protesters. We are very happy to report that the after pressure from hundreds of people, both inside West Papua and around the world; 23 of the 24 Papuans arrested (including the 4 children) were released from Indonesian police custody. 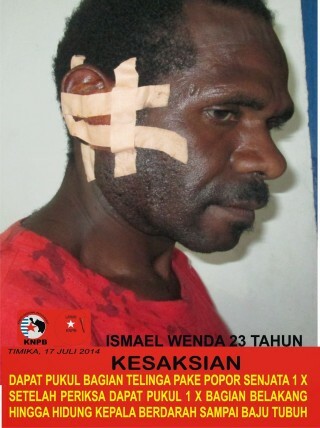 However 1 KNPB leader, Leson Tabuni remained in detention and was among those severely beaten by the police. We continued to urge for the release of Leson, whom the Indonesian police continued to detain in West Papua with scores of other political prisoners who have been behind bars for years. Although eventually released, Leson was severely beaten and battered by the police and military with their guns until his face was completely swollen and bleeding. The West Papua National Committee (KNPB) published detailed reports and testimonies from those arrested and beaten on the 17th July. Many gave detailed and shocking accounts of how they were severely tortured by the Indonesian police including a mother named Merlin Wenda, with her 6 month old child Jekson Tabuni. These human rights violations are acts of evil and injustice still being committed by the Indonesian police and military in West Papua to this day, showing that the human rights situation has not improved. We thank you for all your support in helping to put pressure on the Indonesian police so that the 25 innocent captives arrested have now been released. We will continue to call upon and raise support from the international community to advocate for the release of all West Papuan political prisoners and the protection of their human rights. Most importantly, we will continue to struggle for genuine self-determination and independence for the people of West Papua and we will educate the world about the situation in West Papua, as well as lobbying parliamentarians and other civil leaders to support self-determination for the Papuan people.